Textile skills can be developed with the dolls. Try to create a design, carve out and sew the present coat for winter pore. This is not an easy task, but you deal with it. Wish you good luck! Have you ever wanted to have a coat or anything else, that no one would have? Such unique clothes are obtained only through personal design. 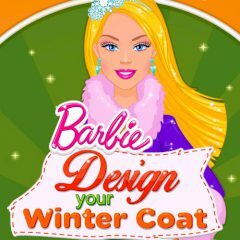 Barbie wants to decorate her winter coat that manner and she needs a help. Maybe you are an expert, she was looking for? Check this out!